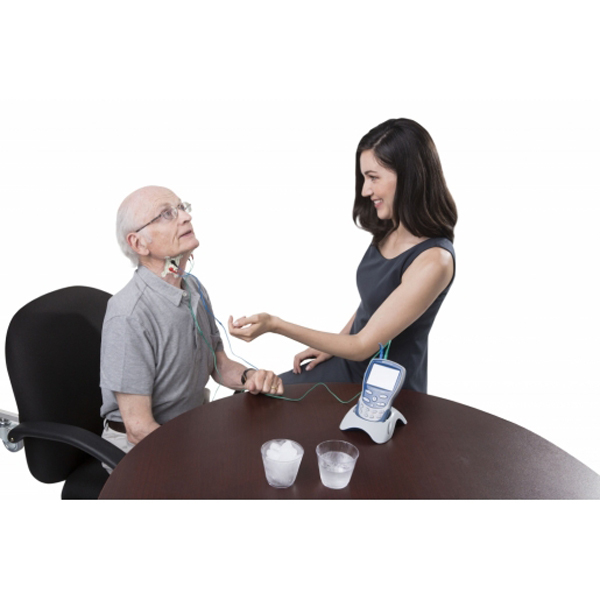 Neuromuscular electrical stimulation helps recruit and re-educate muscles in the process of swallowing. VitalStim® Plus Interactive therapy allows patients to receive visual and audible feedback leading to enhanced patient engagement during swallowing exercises. 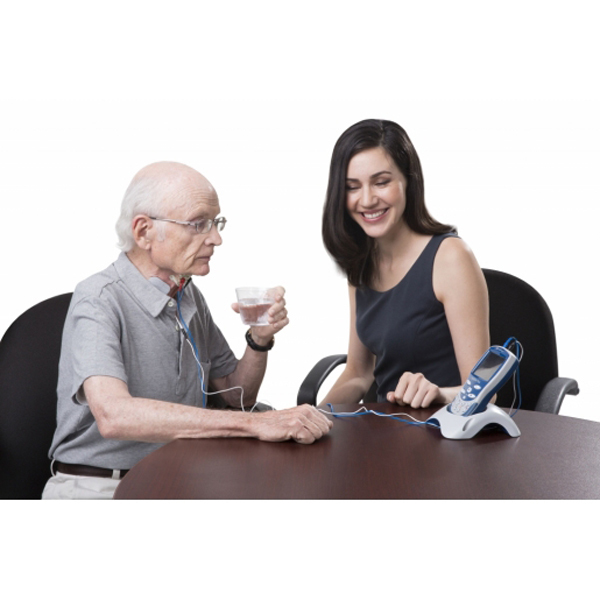 The device supplements a standard therapy program with sEMG biofeedback facilitates functional swallowing recovery. 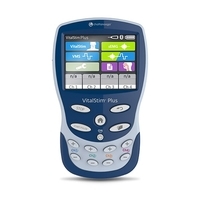 The VitalStim® Treatment is a waveform delivered in Co-Contraction Mode with up to four separate channels to deliver stimulation concurrently and pause at the same time. VMS Treatment customizes your treatment protocol by adjusting the parameters of your choice, such as Phase Duration, Frequency, and Work and Rest Time. VMS Treatment offers even more flexibility by allowing you to sequence the stimulation in the various channels to more closely match the natural swallowing sequence. 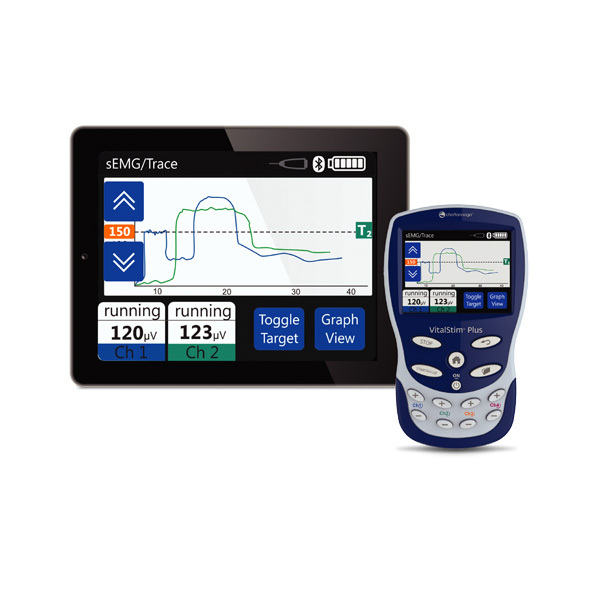 sEMG Treatment provides electrical signals in the muscle that are measured and displayed on a screen and are amplified into sounds that the patient can hear. This feedback increases patient effort and participation, and provides the data and documentation required to measure patient outcomes and quantify progress. sEMG Plus Triggered Stim initiates the swallowing exercise with the assistance of sEMG biofeedback. When the set threshold is reached, VitalStim® Plus will switch to stimulation mode to increase the effort and exercise load. 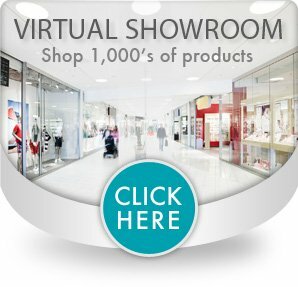 Bluetooth Technology allows screen mirroring technology projects your live treatment onto a computer or tablet screen. This allows the clinician to guide patients through therapuetic swallowing exercises that increases patient engagement. Anatomical Library which includes a Dysphagia image library of Anatomy, Pathology and Therapeutic Treatment options to assist in educating your patient. 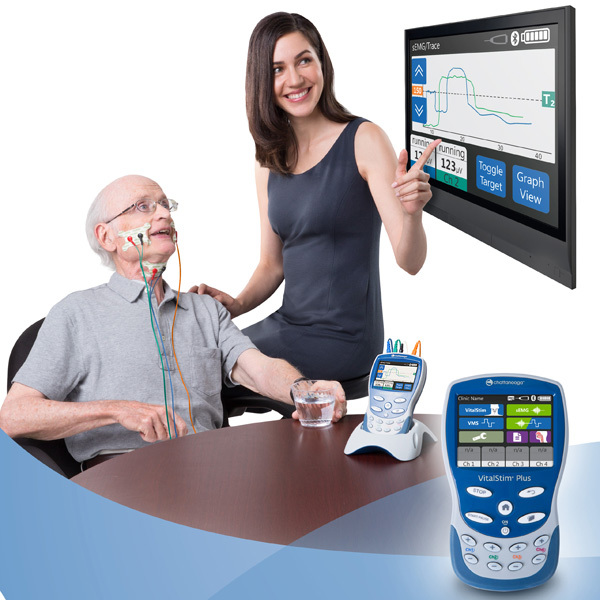 Preset or customized programs allow the provider to truly customize treatments while biofeedback and visuals create a patient-focused experience that encourages engagement and achievement of goals. 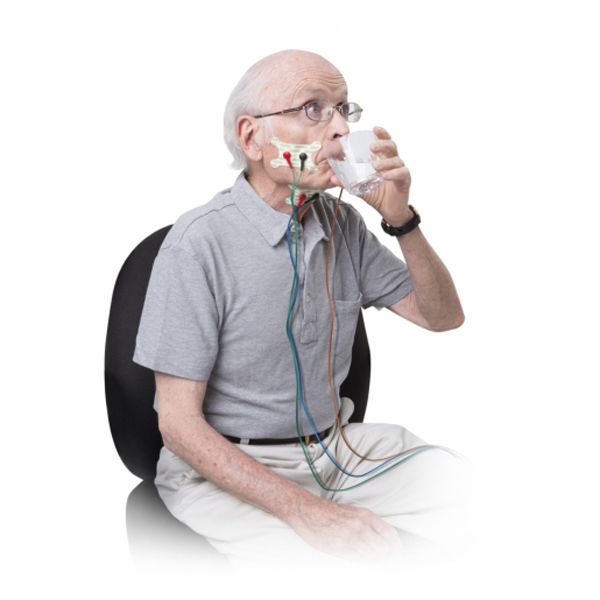 Patient initiates the swallowing exercise with the assistance of sEMG biofeedback. VitalStim® Plus includes four channel unit, 1 set of VitalStim® Plus snap lead wires and clips, 1 set of VitalStim® Plus snap EMG lead wires and clips, stylus, stand, rubber sleeve, operator remote switch, 12 pack standard electrodes, 1 pack of 4 EMG electrodes, batteries, user manual and case. 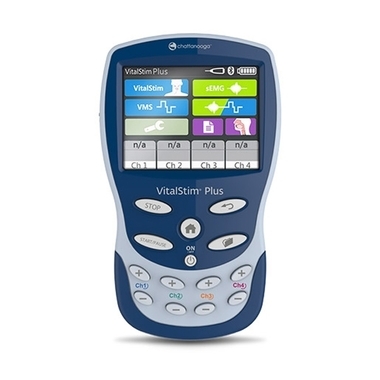 VitalStim® EMG electrodes are compatible with VitalStim® Plus device only. 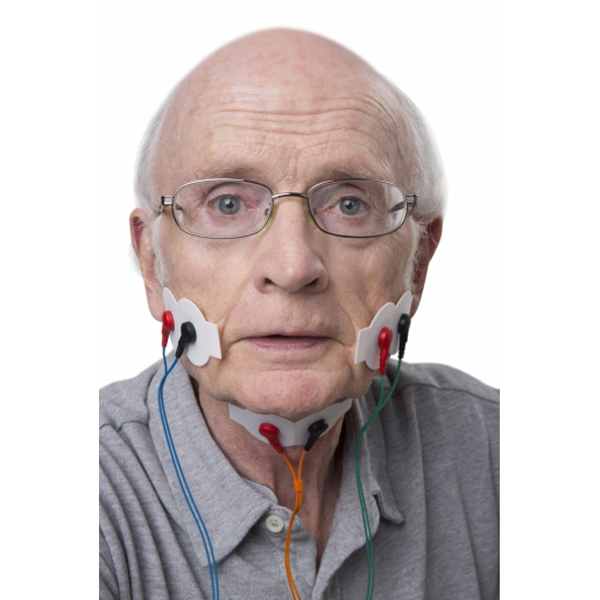 Available in 1 pack of 4 electrodes adult size only.